Lucille “Lucy” Pound, age 90 of Little Rock, passed away peacefully in her sleep Friday, April 12, 2019. She was born on August 14, 1928, to her late parents, Bryan Roosevelt Cole and Oma Mae Holt. She was preceded in death by her husband, Bob Pound; one brother, Bryan Cole and one sister, Carolyn Brown. 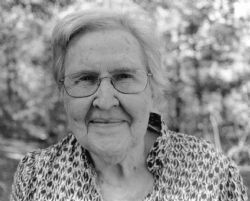 Lucy enjoyed many hobbies including painting, sewing, quilting, gardening, and genealogy. But most of all she enjoyed sharing these interests with her children and grandchildren. She will forever be remembered by her sweet smile as well as her kind and gentle spirit. She is survived by her son, Jim Pound of Hot Springs; two daughters, Linda Mobley (Paul) of Benton and Elaine Hinson (Mark) of Little Rock; sister-in-law, Mary Helen Simon of Colorado Springs, Colorado, and brother-in-law, Mike Brown of Alma, AR; grandchildren, Stephanie Williamson (Brett) of El Dorado, Rachel Cobb (Chris) of Bryant, Drew Hinson (Katie) of Little Rock, Leslie Adkins (Reid) of Little Rock, Mark Mobley (Victoria) of Bryant and Jordan Hinson (Kelsey) of Little Rock; great-grandchildren, Matlynne Franklin (Dustin), Morgan Williamson, Grant Williamson, Carter Cobb, and Elliott Cobb; great-great-grandchildren Emery Franklin and Avery Mobley; and many nieces and nephews. A visitation will begin at 10:00 am Monday, April 15, 2019 followed by funeral services at 11:00 am at Roller-Drummond funeral home, 10900 I-30, Little Rock, AR (501) 455-5800 with Pastor Dave Hughey officiating. Burial will follow at Pinecrest Memorial Park. Click Play below to view the Video Memorial for Eula Lucille Pound.